Pupils in schools in London and other parts of England are wearing green to show support for those affected by the fire at Grenfell Tower. The campaign is asking pupils and staff to give £1 to charity in exchange for wearing something green for the day. The idea arose when students at Fulham Cross Girls' school in London wanted to show solidarity for the fire victims. Fulham Cross head Peter Haylock said more than 100 schools in west London had worn green for Grenfell on Friday. He added: "The idea arose from the students themselves who have relatives and friends who have been really badly affected by the fire. "Some of our students also come past the tower on the way to school. "We came up with the idea of wearing green for Grenfell and we spoke to the local authority, which goes across the three boroughs, Hammersmith, Kensington and Chelsea and Westminster, and over 100 schools have picked it up. "From there, it has gone across the whole of London and the whole of the UK," he said. Around 100 balloons were released at Fulham Cross Girls in memory of those who lost their lives in the fire. 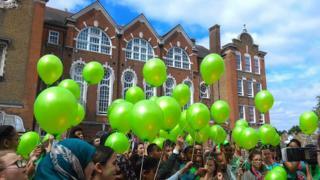 Pupils from three other schools, dressed in green, were invited to be part of the balloon-releasing ceremony. Mr Haylock added: "For me as a head teacher, I know that some of my colleagues have had to do the worst thing imaginable - to tell an assembly that some of their friends will not be coming back." Meanwhile, Belmont School in Chiswick, west London, tweeted that it raised £705.40 for the Grenfell Disaster Fund. "Thank you for your generosity Belmont," a tweet said. The senior leadership team at Outwood Grange School in Sheffield made green jelly to mark the day and offer support to the families affected. Meanwhile, pupils at Oswald Road Primary‏ in south Manchester are also supporting the day, by wearing green clothes and collecting donations for those who have lost loved ones and their homes. "The idea is to do some fundraising to help and to show support for those who've lost everything in the fire," the school tweeted. Schools taking part are giving funds to a number of different charities supporting work in the community affected.